Hello all of you! I’ve been in some of the most sticky flu in my life. Last 4 weeks went by and i havent been doing anything tattoo related for that reason.. So here is some new things i started.. Why i havent post anything completed for a while? Because last few years, i’ve been sketchualing my life too busy. Too many clients, too long periods to wait between sessions each client. This year, i promise to myself: What i will start, i will finish it in few months. I wont take too many clients at the same. I concentrate the going on clients 100% more than last years. I will keep Tatuata still open and still gonna give opportunity to you to have tattoos from us, and from the world class tattooers overseas. 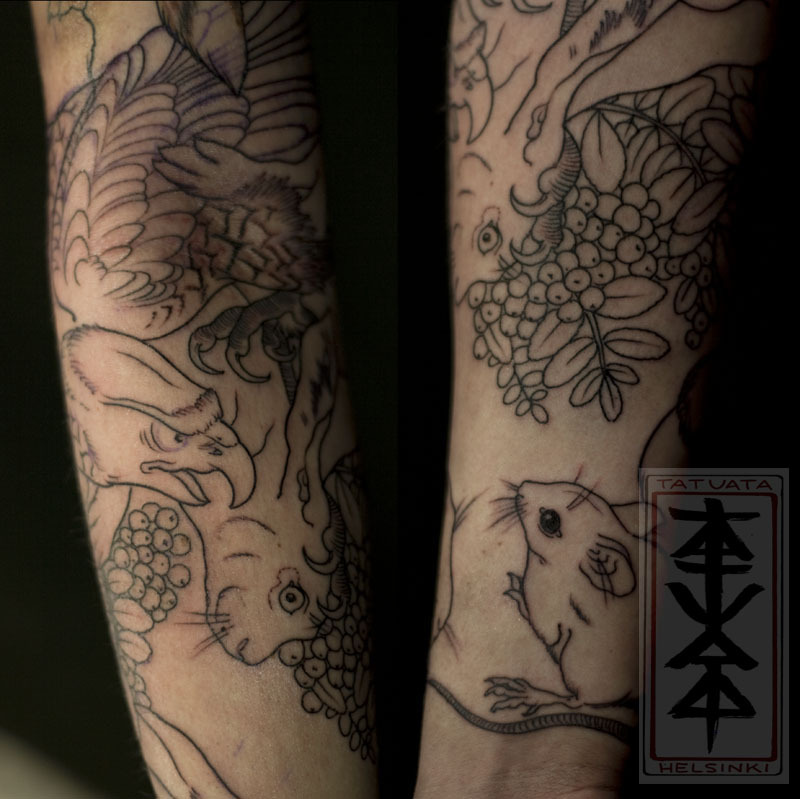 Also there is one problem more: When you do big work; sleeves, backpieces, ribs, anything what will take more than three sessions, some clients get tired-they dont show up so often anymore, they stop to contact you, little by little fade away and dont get their pieces done. 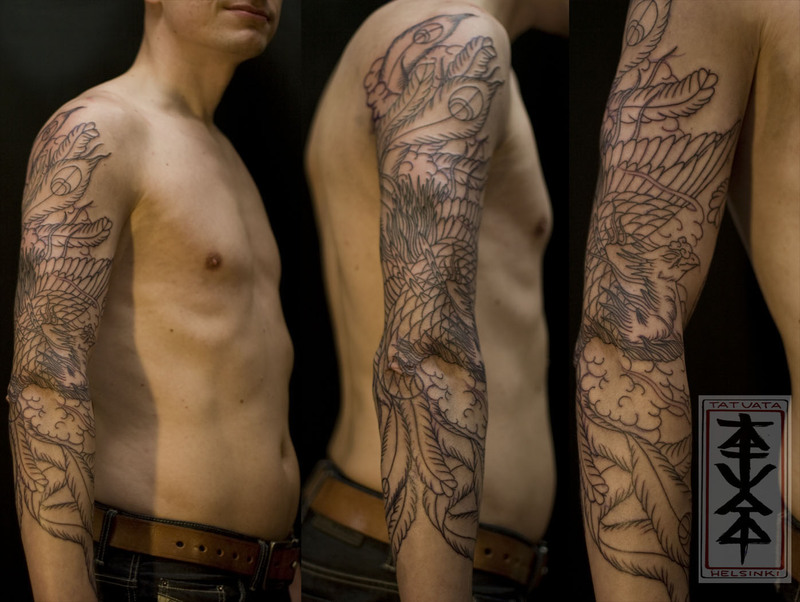 Also many of them never show up anymore after the complete tattoo has healed, so i cannot get any photo.. So please come back, i dont do this work only because of money, i want to see my work after tens of hours working on it! So, my spring and summer is fully booked now. If you want something new, or carry on your never-ending project, contact me by email jarno@tatuata.com or by phone +358 41 578 35 34 and i will put you into the waiting list for the fall-winter 2012. Anyway all the new projects are more than welcome, only its going to take some time to finish these what im processing now. Also this year im going to make little travels again. At least to Rome convention on may and work with Diego Brandi in Subskin, Rome. Aloha tattoo, Barcelona with Monga, Carlo etc. in some point. And of course to Japan again maybe in september! 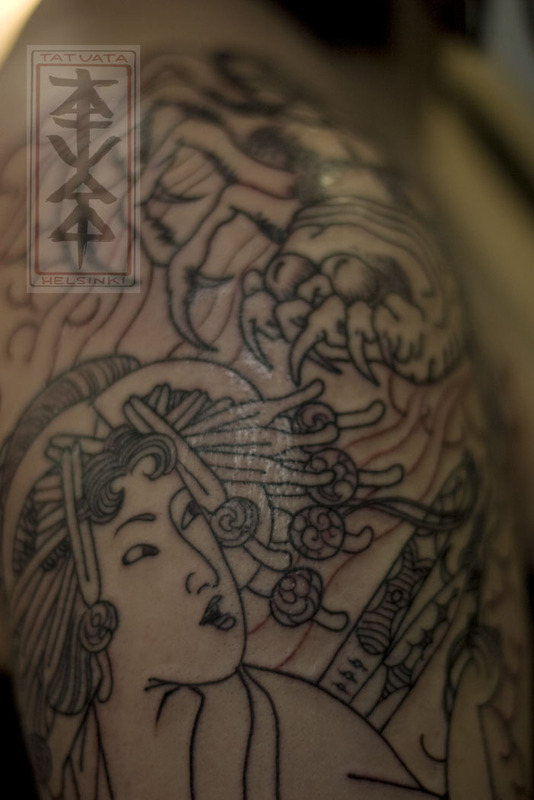 2.session of Mikas Hannya back. Thank you all for watching! Bye! nice maricon!!! all the best! !